It may still be summer and you may even be planning another vacation, but Back to School season is upon us. And you know what that means right? Shopping. I love everything about Back to School shopping, from new clothes to shoes and of course looking for the perfect SALE! Now, try finding those three options in one store, it's usually impossible.. That's until I checked out Carter's! 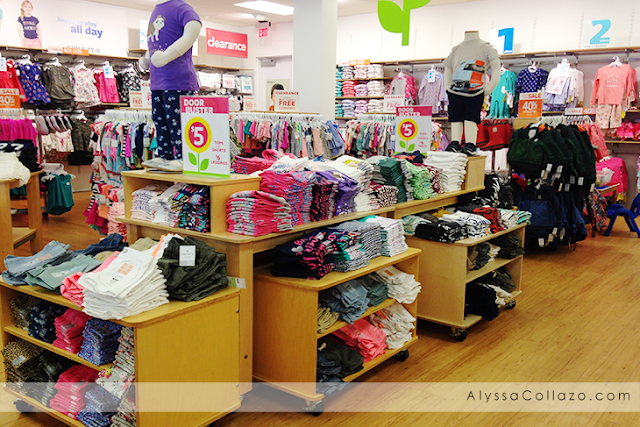 Carter's is my one stop shop for all my Back to School needs, from their ready-to-play shorts and tees, to their assortment of easy outfits and let's not forget Carter's now offers clothing up to a Size 8. Which in my case means, matching outfits for a longer period of time! This year, I have two little ones to shop for. My oldest is going into 3rd grade and my youngest is starting Pre-Kindergarten. Matching outfits is nearly impossible for me. One likes bright colors while the other likes pink and glitter. From the moment we walked into Carter's, I just knew it was meant to be. Everything was Cute, Colorful and Modern. There was so much available. And not just for girls but for boys too. First, we looked at the $5 and up Door-busters, which offered long and short sleeve shirts and the cutest leggings, along with shorts. Sizes were easy to find and it was seriously an explosion of prints and colors. Hands down this was my favorite display. Carter's staff was absolutely incredible, they always checked in on us to see if we needed help. Which was perfect because they let us know about all the sales going on, gave me tips and even helped me match a few outfits. Customer service like this doesn't happen often. While I personally like shopping in stores, Carter's also offers hassle-free online shopping. Now I'm sure you're wondering. How did I not buy everything? I mean with the amazing sales like the ENTIRE store is 40% off or the wonderful door-busters. I'm surprised I walked out of the store with one bag. And not a small bag. A bag almost as big as my 3 year old daughter. Can you believe I actually put together 4 outfits (long sleeve shirts and leggings), plus 4 long sleeve shirts and a pair of overalls for under $110. That doesn't happen very often, but it's honestly because of all the sales Carter's has going on. Like, the Bright Now Sale 40% off Entire Store and this ends August 4th. Plus, $5 and up door-busters that includes: $5 baby short sleeve tees & shorts, $6 toddler/big, $6 Pants, $6 Leggings $6 Slogans & $12 Hoodies! 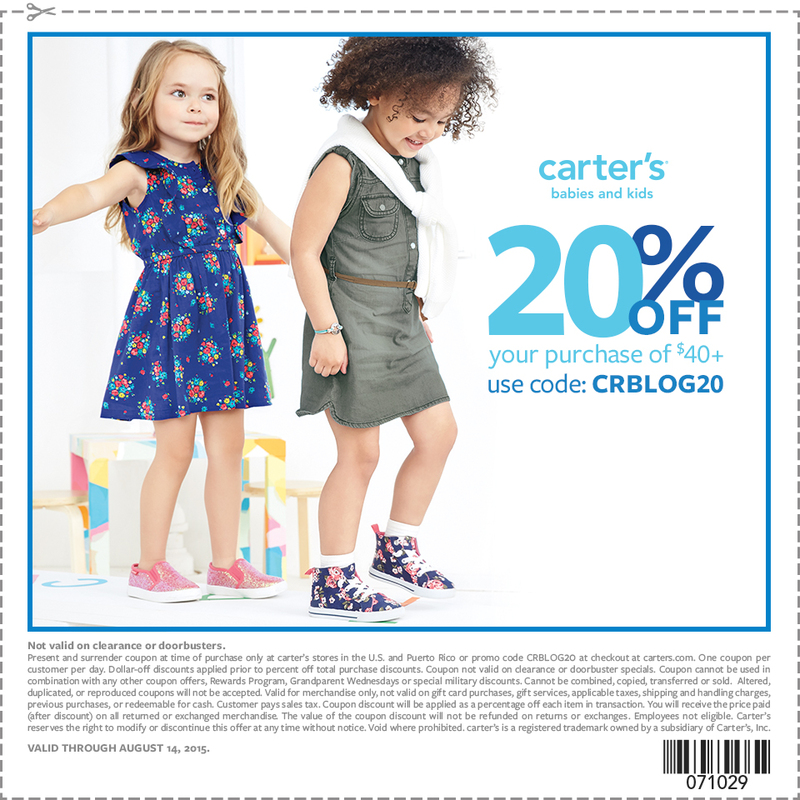 Carter's is even offering 20% off your purchase of $40 and more. This coupon is valid through August 14. For all your Back to School shopping needs, be sure to check out Carter's. They have fashions that both you and your little ones will absolutely love. I know my girls love their Back to School clothes and can't wait to wear them when school starts. You can connect with Carter's on their Website, Facebook and Instagram. I love Carter's. I shop there for my boys all the time. I Love the way their clothes fit them. I've never shopped at Carter's before. The clothes look adorable, though. I loved Carter's clothes when my kids were little! They grow up too fast! Enjoy buying these cuz soon she'll want nothing to do with your taste in clothes lol. Looks like you got some seriously cute stuff! I love Carter's matching outfit sets. The colors always go well together. I have to head over there to shop for my son on their size 8 clothes. Can't wait up pick up some cute stuff! This is the perfect place to shop for new back-to-school outfits. That is such a great sale! It is great to find a store where the staff is so warm and helpful. The clothes are very nice and I am sure both mommy and baby would agree to it. Carter's sounds like a great place to shop for back to school clothes. The 40% door busters is totally an awesome sale indeed. I love they have an online store too. Thanks for sharing. Carter's has been around so long because of the quality of their clothing. I've always trusted this brand when it came to buying clothes for my kids when they were little. I used to shop at Carters when my kids were little. Look how haoppy the face of your little fashionista and shopper. Carter is one of my favorite place to shop with my little girl. The quality attracts me and so the design. I might go back on Friday which is tax free at my end. How fun to go to Carter's to get the two ready for school. I always did like their quality of clothing too. We love Carter's! They always have very nice clothes. Thanks for sharing, amazing deal! We've started our back-to-school shopping over the weekend, but we're not done yet. We are going to check Carter's sale. Gotta love those discounts! Carter's is the best! It's my go to shop for kids' clothes. We're not done shopping, yet and we're definitely checking out their sale. Wow it looks like you got a lot. I just love Carters. They always have great items for sale. Carters is a great clothing brand for kids. I will have to share this with my friends with kids. Aww that is so great, sounds like everyone had a great time shopping there. I can't believe school is just around the corner. 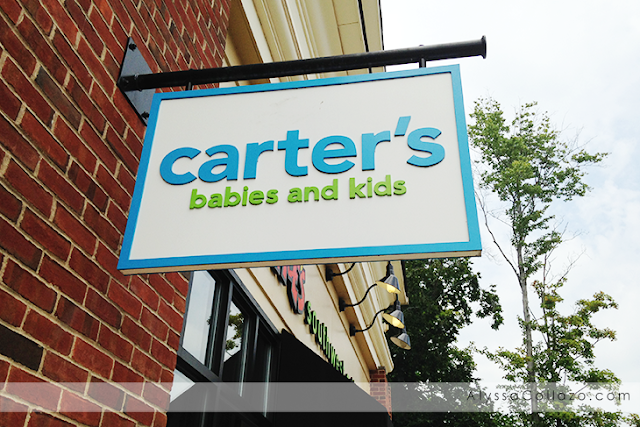 We have a Carters not too far from our house and I plan on checking them out for my son's back to school clothes shopping! I have always loved their clothing! Too bad there isn't a Carter's store within my vicinity. Looks like your little girl really enjoyed the trip with you. Thanks for sharing a great coupon. I love Carters for my grandson they have some really cute outfits even for boys. I loved shopping at Carters for my youngest sons Easter outfit. The door busters were a great deal. I love the quality if the clothing too. I love carters!!! My daughter has so much stuff from there. Everything is just so cute!!! Carters always has such great clothes for kids! Thanks so much for the coupon! I’ll definitely use this for my son! 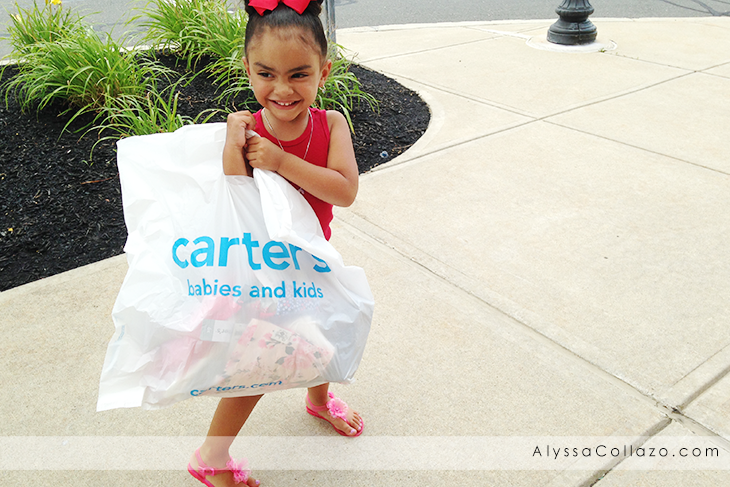 I loved shopping at the Carter's outlet near my home when the kids were little. They have such cute clothes and they are so affordable. I need to stop there this month! We have an outlet and love their sales. 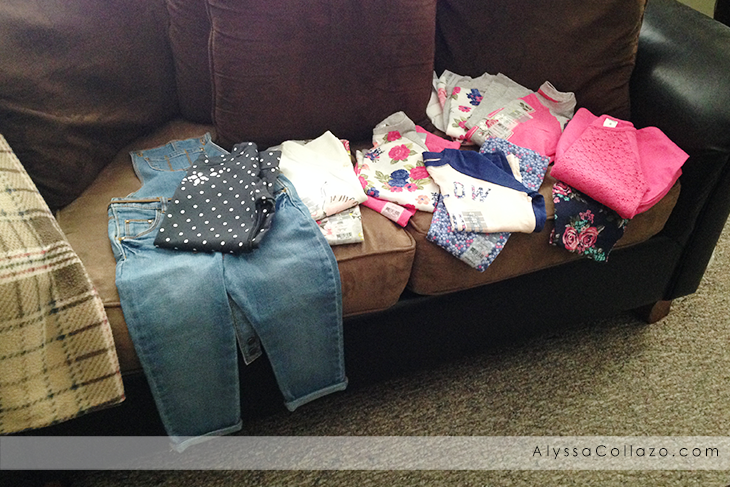 We just got a shipment of Carter's back to school clothes from my recent online order - I may have to get a few more things before school starts next week! So many great styles!